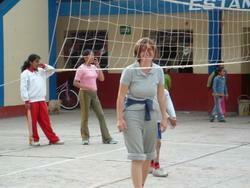 School Sports are extremely popular in the Sacred Valley of Peru, with volleyball high on the agenda. Wherever you go you are sure to see children playing volleyball in the streets. Basketball and football are also popular games. If you have a passion for developing sports in schools you can help to coach children in these sports in the local area as a volunteer Sports coach. While volunteering abroad you could dedicate your time to the sport you love or help with a range of lessons. 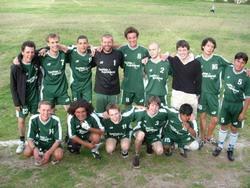 You can also combine your Sports placement with teaching English. Just let us know where your interests lie once you have applied and we will match you to a suitable school. You can volunteer on a Sports coaching project in Peru without any previous experience of coaching, although it is fantastic if you already have some. Volunteers are welcome no matter what stage of life they are at - during a gap year from education or a career break or even as an alternative holiday. All we ask is that you have a passion for sport and a desire to help others to develop their own sporting ability. We offer our volunteer Sport coaches the opportunity to work with Physical Education teachers at local schools in the morning and then work in the afternoon at a sports placement at the Apu Pitusirary sports centre, located in the town of Calca in the Sacred Valley. The centre is also an official sporting academy for one of the biggest football teams in Peru, Alianza Lima. At this centre there is scope for coaching football, basketball and volleyball. There are around one hundred-and-fifty children who attend this sport project, ranging in age from 6 to 14 years old. This project provides our volunteer coaches with an excellent variety of skills and talent to work with. The main emphasis of the Apu Pitusirary sports project is to get as many children involved as possible. Offering sporting activities in this way means children become fitter and healthier, as well as giving them a sense of belonging to a team of people with a common goal. This in turn has positive benefits for the wider society because the youth in the local community are engaged in wholesome activities, which give them structure and purpose. A further goal of the centre is to develop the standard of sport in the area. Though they currently offer just the three sports of football, basketball and volleyball, they are always keen to develop other areas, so let us know what you can offer. Please also let us know if you would like to focus on one particular sport or get involved with a variety. All volunteers on Teaching, Care, Community, Medicine & Healthcare, Sports or Spanish placements in Peru now have the opportunity to add a 7-Day Conservation Project to the end of their main placement. For more information please visit our 7-Day Peru Conservation Project page.